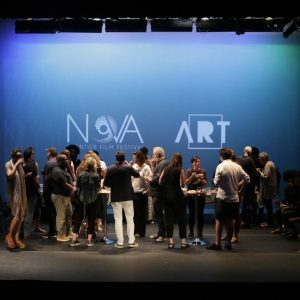 Nova Frontier Film Festival and Lab is a film festival dedicated to showcasing experimental, documentary, and narrative films by artists and filmmakers of the African Diaspora, Latin America, Caribbean, and the Middle East and promoting intellectual engagement and intercultural understanding through the arts. The 2019 edition of this big event will be held in Brooklyn, New York City on September 20-22. Nova Frontier Film Festival and Lab was founded by Billy Gerard Frank and Lydia Darly. Billy Gerard Frank is a Grenadian filmmaker and multimedia artist, whose work addresses issues of post-colonial subjects, minority status, sexuality, global politics, race, and migration. Frank has been an artist-in-residence at several artist residencies, and his films have been screened at many international film festivals. Moreover, this year, he will represent Grenada at the upcoming Venice Biennale that will start on May 11. Lydia Darly is an award-winning French actress and filmmaker of Guadeloupean descent. She started her career in avant-garde and experimental theater in Paris, worked as a model and actress in Rome and the United States, and assisted the American award-winning writer-director Jordan Bayne on the 2011 film “The Sea is All I Know.” In addition to all her talents, Lydia Darly is also a programmer and speaker at different film festivals, who supports women in film and independent filmmakers. Nova Frontier Film Festival and Lab is a very important event organized by a team of incredibly talented people. It helps realize ambitious projects and provides career opportunities to emerging filmmakers from around the world. This amazing festival definitely deserves your attention!